My sister is due to have a baby next month and I have a chart ready for stitching up for that happy event. – make a good start on my three rotation pieces so that they “scream” to me (at the moment they kind of whisper). – get some more ornaments done – maybe one a month for the rest of the year. ≈ Comments Off on Happy Dance – really! 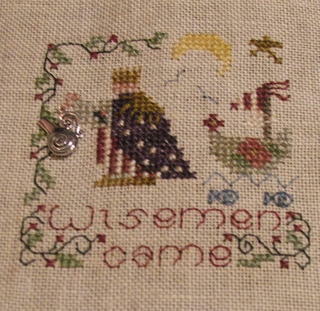 Here it is – I finished 5 minutes ago. Rushed in to show Joel, took a photo, loaded into my computer and uploaded it to blogger images! Whilst I’m going this… I’m watching Anthony Lapaglia on a “Enough Rope” (a talk show)… he’s kind of charming. I was amused this evening because I received 6 emails within 5 minutes from my Aunt and Uncle in England telling me they’ve changed their email address – my relatives are spammers! I took it as a hint to give them an update on what we are up too. We have terrible communication skills in my family – we hate to write to each other, phone etc but when we get together it’s like no time has passed at all. I love them all. This is where I plan to leave this Rose Arbour… She’s too big for the fabric that came with her kit – Dammit! 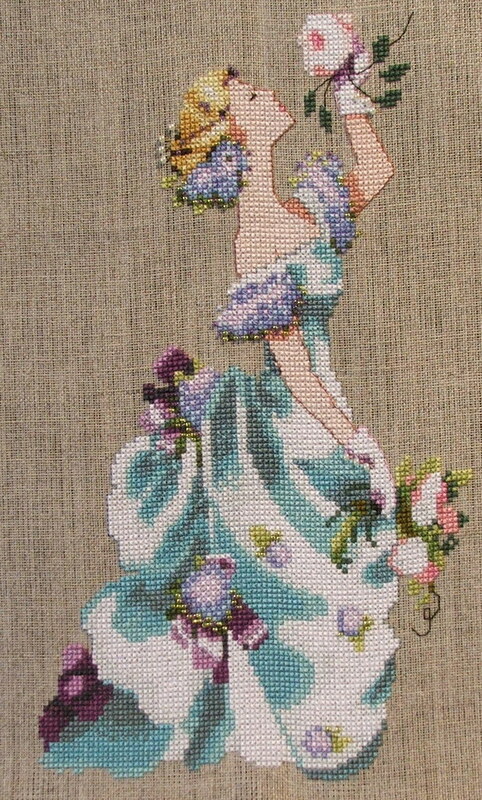 I managed to get the backstitching and some of the beading done last night and finished her off this morning. She’s so beautiful! 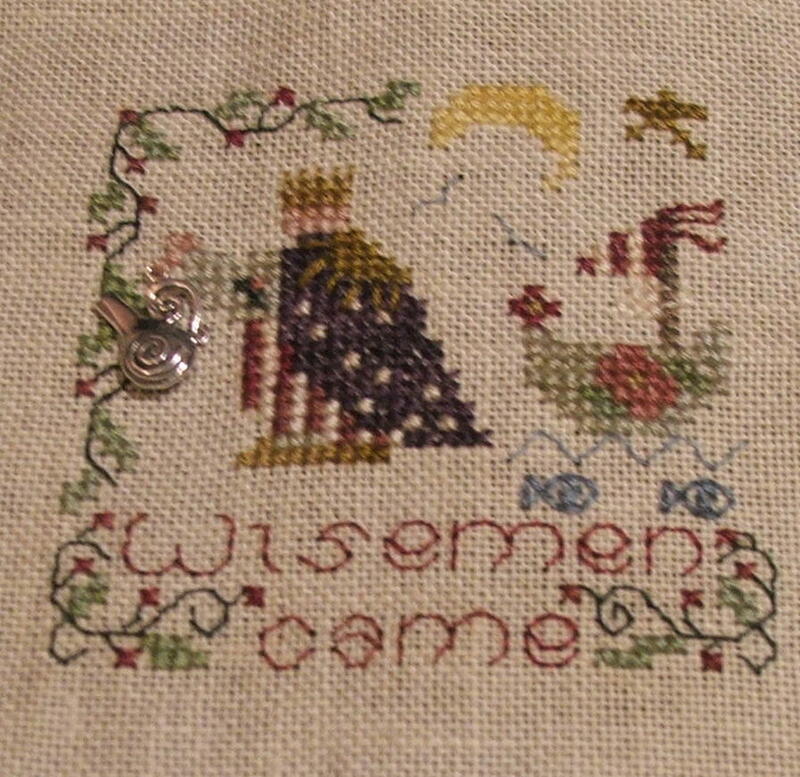 I will definately do her again – I have enjoyed stitching her so much. I’m planning a trip to the framers next weekend. Went forth to Garden City today to visit Lush as recommended by Melanie. I bought two bars of soap and a bath bomb. The soaps were… Figs and leaves and Demon in the dark. Figs and Leaves promises to be very moisturising (which is what this old crone needs right now! And Demon in the dark has a yummy, yummy smell! I got the Softy bath bomb which promises “a calming and aphrodesiac bathtime” ooooh! 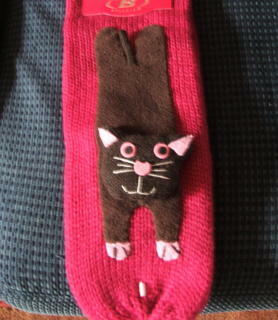 I also got these socks – are’t they cute!